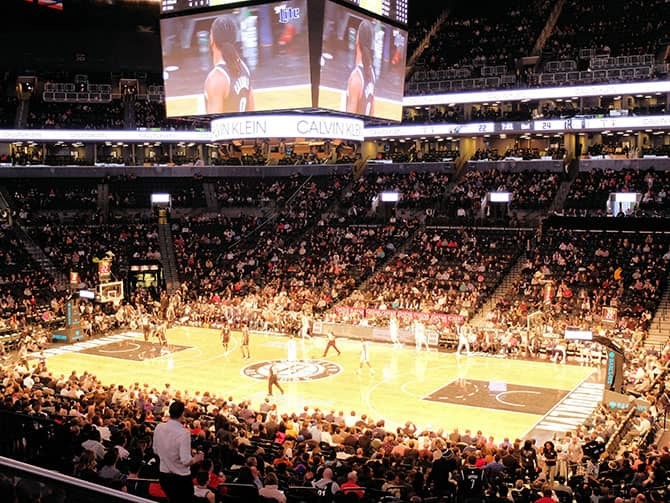 Brooklyn Nets tickets are easy to buy online before your trip to New York. Seeing a basketball game in New York is a fun thing to do, even if you don’t like sports. Also tickets are relatively cheap so it is definitely worth adding it to your agenda. Brooklyn Nets play in a big indoor arena in Brooklyn called Barclays Center. The basketball season runs from October to April. If you are in New York but can’t get tickets to a Nets game, check whether the New York Knicks are playing. Brooklyn Nets and Knicks are fierce rivalries both being teams based in New York. 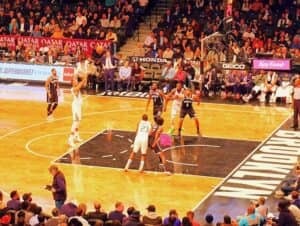 Buy Brooklyn Nets tickets now and pay no service fee and get a free shipping (e-tickets) or choose free local pick-up! 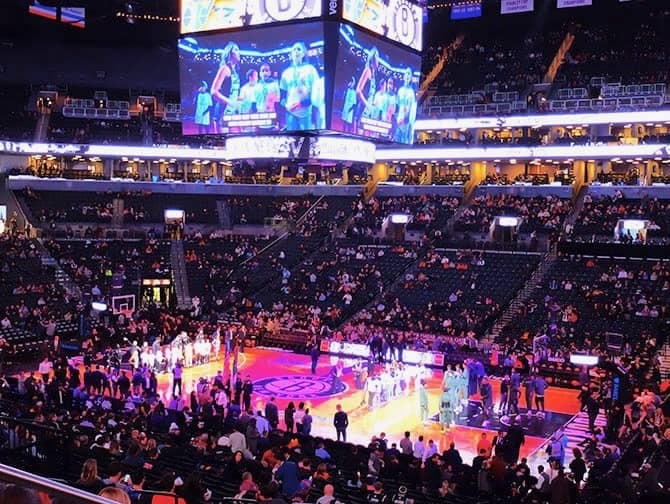 Buy Brooklyn Nets tickets by viewing the game schedule here and search for the date when you’d like to go to a basketball game or check the table below. The tickets can be paid by credit card and are sent to your address or emailed to you. You can also pick up the tickets in New York for FREE from a local pick-up point. If you can’t print out your e-tickets, you can also drop by the office, it’s centrally located near Times Square. Choosing e-tickets is the fastest option and the local pick-up is the best option for all other tickets. Both options save in shipping costs and I highly recommend either option. Your tickets are 100% guaranteed authentic and delivered on time. Tickets are available at discounted prices because they are from season ticket holders who are not able to go to the game. Sometimes the tickets are more expensive than the original price, this means that the Brooklyn Nets game has been sold out. Where should I sit at a basketball game at Barclays Center? You should sit as close to the court as possible at Barclays Center but these seats are the most expensive. But you can still follow the game even if you don’t sit so close to the court. It is more important to sit at the sides rather than be very close to the court. The chart below shows you the best value for money seats, sections 207, 209, 223 and 225 are ideal. Good to know: the lower the row number, the closer you are to the court. Therefore row 1 is better than row 20. How do I get to the Barclays Center? 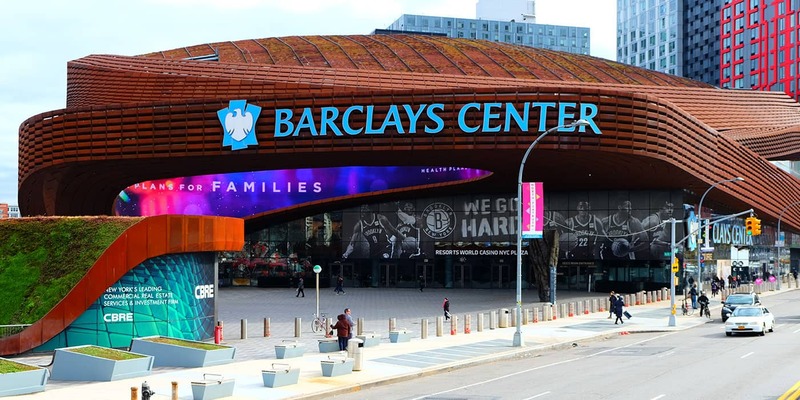 It is very easy to get to Barclays Center and you should not let the Brooklyn location intimidate you. Subway is the most convenient way to travel to Barclays Center. You can take subway lines 2, 3, 4, 5, B, D, N, Q and R to Atlantic Avenue – Barclays Center. You’ll exit right in front of the stadium. The journey takes about 22 minutes from Grand Central station. When do I need to be at the stadium? I would suggest to arrive 30 – 60 minutes in advance. Take the subway to get back to Manhattan after the game. It’s the easiest and fastest way. It’s also safe to travel with the subway back to Manhattan, because you will be going with thousands of other Nets fans.